Now that the weather has finally started to cool down and everything is beginning to feel a bit more “fall” around the LaurenConrad.com offices, we couldn’t be more excited about breaking out some of our autumn ensembles. We wait around all year to dust off our boots and pull out our scarves and sweaters. Since the seasons have officially changed, we’ve been on the lookout for outfit inspiration—and we found it right here on LaurenConrad.com. Shannon D., we spotted your autumn outfit and we were immediately impressed—You are our Chic of the Week! There are so many reasons why Shannon’s style won us over. For starters, we love a classic chambray shirt. It is one of our favorite year-round pieces that can transition effortlessly from warm weather to chillier temps. 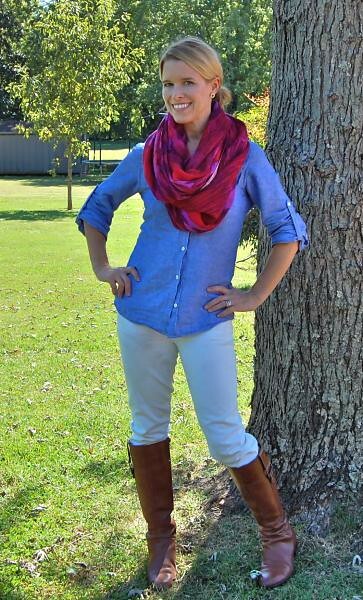 Our Chic paired her chambray top with light jeans, brown riding boots, and a colorful fall scarf. She kept her hair off of her face and in a sleek pony—the perfect windy-proof ‘do. But what we love most is her confident attitude and her big smile in this photo. Shannon, you nailed it with this adorable autumn outfit! Congrats on being our Chic of the Week! What do you love most about Shannon’s style? What trends are you excited to try this fall? P.S. If you love reading about fashion trends, take a peek at the Wear section on our website. It won’t disappoint.